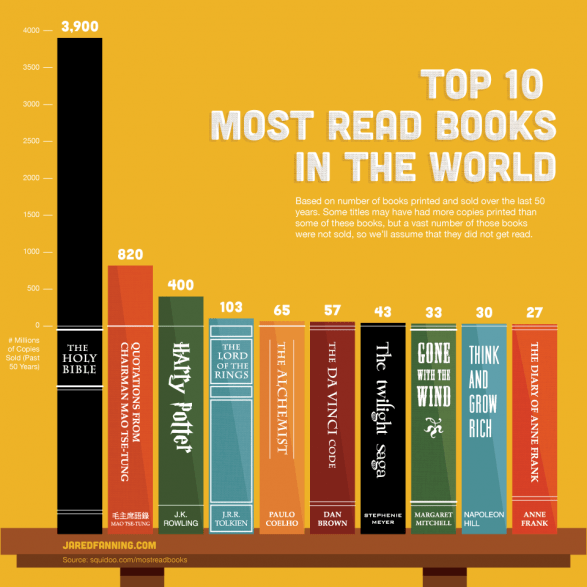 I’ve decided that I’m obviously more thinly than widely read when confronted with the top ten list of most read books. Other than having had to read through swathes of the Bible while at school, I’ve not read one of them – not even The Lord of the Rings. Having admitted this, I’m not too full of regret at not having read The Twilight Saga, The Da Vinci Code or any of the Harry Potter books. My omission of The Diary of Anne Frank smarts a little though. I must add it to my Kindle. by Jared. Browse more data visualization. This entry was posted in Books, Reading and tagged da vinci code, diary of anne frank, harry potter books, literature, Top Ten Books. Bookmark the permalink.